Sea lions are very curious, somewhat playful animals. Living in large family groups, they rely on the strength of numbers for safely and survival. 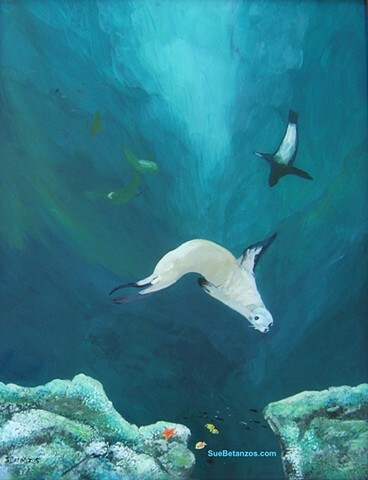 This reverse glass painting is of a female sea lion, observing the diver. Painted directly onto the backside of the glass, backwards, the painting reveals the grace of these sea going mammals. Awkward mammals on land, sea lions are slip stream quick silver sure in the water, sliding through the depths with grace and ease. The photo was taken at the Ranch House Gallery in Agua Caliente, hence the reflections in the painting. Exhibit is from: Jan. 12 - Feb. 14. Gallery hours: Wed. - Sun. 10 am - 3 pm. Speak to the artist, me, on the weekends from 11 am - 3 pm! Contact me to commission your own artwork!